There was a lot on the line coming into the final European Poker Tour Main Event. After 13 seasons, the PokerStars tour was making its final stop before the site-sponsored Championships and Festivals commence at the start of 2017. Headlining the storylines were David Peters and Sam Cohen. Peters was looking to capture his second leg of poker’s Triple Crown in 2016 after winning a World Series of Poker bracelet in June. Additionally, Peters could overtake Fedor Holz for the number one position on the GPI list with the end of 2016 right around the corner. For Cohen, she had a chance to become the first America women to win an EPT Main Event title. Despite the marquee names, it was Dutchman Jasper Meijer van Putten who stole the show on his way to victory. Cohen had her run at history cut down in only the third hand of play as Peters showed her to the rail in a huge pot. Marton Czuczor opened the action with to 280,000 and Peters called in the cutoff with . Cohen defended her big blind with and the three players saw a flop. Action checked to Peters, who bet 350,000. Cohen stuck in a raise to an even 1,000,000, which induced Czuczor into folding. Peters called and caught a third nine on the turn. Cohen shoved all in for about 3,000,000 and Peters called immediately. Needing a queen or a heart, Cohen found neither on the river and collected €145,900 for her final table finish. 19 hands passed after Cohen’s elimination beforeMarius Gierse was eliminated by Czuczor. The start of final table chip leader opened to 280,000 from the cutoff with and called the all in shove of 2,940,000 from Gierse, who was on the button. Holding an inferior pair , Gierse had his work cut out for him heading to the flop. The board ran out and Gierse took his leave. Meijer van Putten was quiet for the earlier portion of the final table but made a major statement via his bustout of Sergei Petrushevskii. With the blinds at 80,000/160,000, Meijer van Putten opened under the gun for 400,000 with . Czuczor then stuck in a three-bet for 1,150,000 on the button with . From the small blind, Pertushevskii moved all in for 3,770,000 with which prompted Meijer van Putten to reshove for about 8,000,000 total. Czuczor folded a crucial pot at the final table was up for grabs. The flop gave Pertushevskii some backdoor equity but the on the turn left him needing a queen on the river to chop. The two outer did not come and Meijer van Putten took the chip lead heading into three-handed play. Meijer van Putten, Czuczor and Peters were tightly bunched together and tried negotiating an ICM deal. After 40 minutes of discussion, the trio could not come to a final agreement and play resumed. Play went for about two full 90-minute levels as Meijer van Putten grew his chip lead over his opponents. It was Peters who was the short stack for the majority of play and eventually met his end at the hands of Czuczor. From the small blind, Czuczor raised all in with having Peters covered. Following a few moments of thought, Peters called with for his last 12 big blinds. The flop paired Peters to put him in the lead. The was safe for Peters but the on the river gave Czuczor the higher pair to send the new GPI number one to the rail. Meijer van Putten started heads up play with a nearly 3-1 chip advantage over Czuczor. The two went back and forth for 15 hands as Czuczor pulled nearly even with Meijer van Putten. A deal was struck between the finalists with Meijer van Putten taking €649,300 and Czuczor receiving €630,000, leaving €50,000 left to play for. 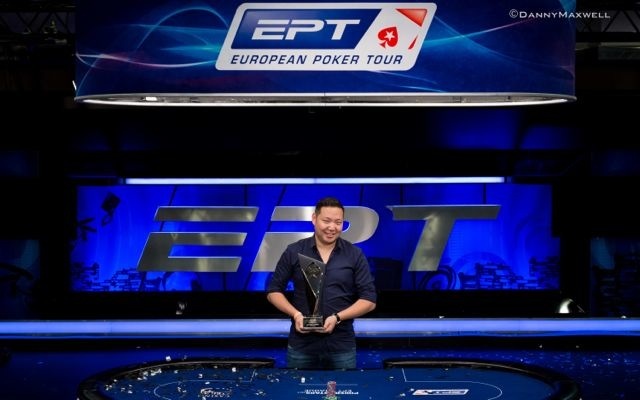 On the 164th hand of the last EPT Main Event final table, Meijer van Putten finished Czuczor off to claim the title. With the blinds at 150,000/300,000, Meijer van Putten opened to 700,000 with on the button and faced a shove of 8,025,000 from Czuczor . Meijer van Putten called and was a flip away from the title. The flop gave Meijer van Putten the lead and left Czuczor needing a two, and a two only. The turn and river were blanks and Meijer van Putten clinched the title and his first career major title. Peters locked up the GPI number one spot with his third place finish and has all but sealed his place on top before the end of the year.